Grace and I are with family today, but we will be back in the shop on the 23rd. From that point forward, we will be working in the shop every day until we depart for Corvair College #30 at the Zenith Factory in Mexico MO September 16th-18th. Sign up for #30 was open for 90 days, but is now closed. After the college we will be staying at for 2 more days for the Zenith open house before heading back to Florida. If you couldn’t make it to the college, but are thinking of heading to the open house, please attend, we will no longer be wrenching on engines but we will have a full compliment of our parts, be doing core inspections, and most of the pilots planning on flying in for the College are planning on staying through the open house. It is a good chance to meet other Corvair builders. If you are one of the builders who signed up for #30, we will be shortly sending a series of emails with more information. This is standard procedure for colleges. We send the bulk of the prep work info after the sign up closes because we send it as a block email to everyone and if builders have questions we cover the answers in a FAQ page for everyone to read. Barnwell is always our year end event, it is the classiest show of the year. If you are considering bringing your spouse or family to any event, Barnwell is perhaps the best one on the calendar. We always have a very special dinner and award the Cherry Grove trophy to the aviator who has made the greatest contribution to Corvair powered flight that year. P.F. Beck and his crew make the event classy, and this year will be their 5th consecutive event at Barnwell. Don’t miss it. American Hank Wharton, legendary arms smuggler, who used planes like the Lockheed Constellation above on repeated missions to fly food to starving Biafrans through Nigerian jet air defenses in 1968-69. A ‘Humanitarian’ with solid brass balls. There is a fair chance that a man standing in parents home in NJ today survived on food that came off this aircraft. I write this from my parents home in NJ. Traditionally we stop here for a few days on our way home from Oshkosh, a 1,000 mile detour we also use to make summer house calls. This year we have extended the stop to 14 days because my Father broke his leg in a fall just before Oshkosh. Grace the dog and I are now taking a turn caring for him at home, following all the other children who have been here already to relieve my brother and his wife who have done the lion’s share of the work thus far. Dad is doing much better, and Grace and I will drive back to the shop in Florida and be at work by the 23rd. Over the years I have shared a number of stories about my father because I am very blessed to be his son, but I has always been my hope that these stories were a catalyst for friends to consider how all of our Fathers who made us who we are. Countless builders have also shared stories of their own Fathers in letters and in person, and I have listened to them all with admiration for the love they contained. To assist with the care at night, the family has brought in skilled CNAs. One of them named ‘Remmy’, was very moved that in our family he could not differentiate children from spouses by watching us; everyone calls my father ‘Dad’, and my mother and father treat us all the same. He took a moment to explain that he had emigrated to the US, but his childhood was in Africa, and he said “This kind of family, it is the strength and the riches of Nigeria.” He went on to explain that he was from the eastern half of the country which was Biafra, and he was a three year old during the war, surviving what many others did not. When a man born into war in one of the poorest countries on Earth takes a moment to remind you that the greatest poverty is not the absence of wealth, nor even of sustenance, but it is the absence of family and love, his words are worth considering at length. -ww. Here are a few photos from Oshkosh this year. We have a lot more, but these will give some flavor of the event, along with comments to give some idea of what I still find interesting about Oshkosh, even after making 24 trips there. Above, myself, Grace and the legendary Chris Heintz, inside the “One week wonder” tent where the Zenith 750 was built in a single week. Chris is autographing a copy of his design book to Grace and myself. I consider this man on a plateau with Bernard Pietenpol and Steve Wittman. The norm in experimental aviation is that very talented designers start by making affordable designs for rank and file EAA members, and after they are known, they ‘progress’ to just making ultra-expensive toys for the wealthy. 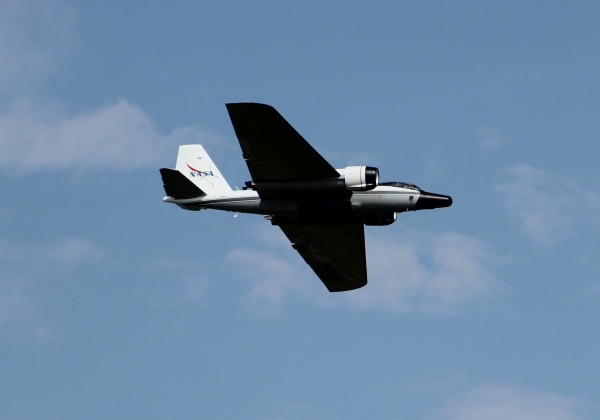 Rutan is an easy example, going from the Vari-Eze and Long-Eze to working with Richard Brandson on ‘affordable’ spaceflight. A “Lancer 200”, (the first Lancair), was a neat affordable plane, and a long way from a turbine IVP. To a lesser extent, An RV-3 is not the same idea as an RV-12 nor RV-14. There are a wealth of products for the wealthy not just because you make more money selling them, but it is actually easier to design things for people with bigger budgets. The simplest product requires the cleverest designer. There have been only handful of designers who have continued to meet the far tougher challenge of designing good planes for people with a tighter budgets. 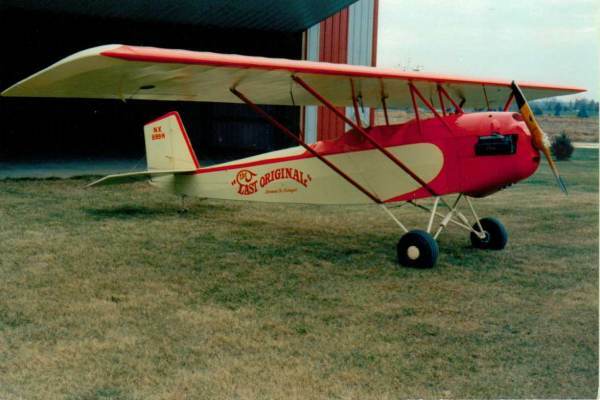 As a servant of the rank and file EAA builder, Chris Heintz has produced 14 commercially successful affordable designs in succession. He is ‘retired’ today, and makes the trip from his home in rural France to Oshkosh infrequently. He made it this year to participate in the “One week wonder” build. This was a recreation on a grand scale of Chris and a small crew building an early Zenith kit at Oshkosh in the 1970s in a single week. Chris is by far the most approachable of all the well known experimental designers. I have met many of them, and respect them all for different reasons. In recent years, many of these designers wrote their memoirs. Almost all the other books were a look back at their work for people to admire. Conversely, when Chris wrote his book, it was a design textbook, because first and foremost, he is a teacher. Above, a Martin RB-57F flying for NASA at Oshkosh. This is a good example of something you can only see at Oshkosh. This aircraft was the predecessor to the U-2. Want to know what really exacting engineering with slide rules was? To get performance, the wing was engineered with a 500 hr fatigue life span. It did not have one spare ounce of weight in it. There is modified B-57 on static display at Warner-Robbins AFB, but nothing is like seeing the plane fly in person. This particular one spent 41 years in storage at Davis-Monthan before being brought back to service. This is the record for longest storage a return to flight from the D-M bone yard. Above, the EAA is actually investing in homebuilding education. I had a strong attachment to the low wooden workshop buildings because I gave nearly 20 years of forums there, but these have been torn down and replaced by first class buildings on the same site. Mark Forss, who does an outstanding job of organizing all the forums at Airventure, set us up with several in the new buildings. They were well attended and lively. Above, Our booth was packed at peak times of the week, I am standing on the display conducting a Q&A on Corvairs for a large group of builders, Inside the tent, we have a large amount of educational information. This year, Roy brought his actual water brake dyno to display. As I said previously, most companies claim to have run their engines on a dyno, but can’t produce a single photo of the alleged test. The world of Corvair building is different: we display the dyno itself. If you look closely at the photo you can see ScoobE in the arms of 3,000cc Corvair/Kitfox builder Mike Marury. Because the dog is looking right at the camera, you can tell Grace took this photo. 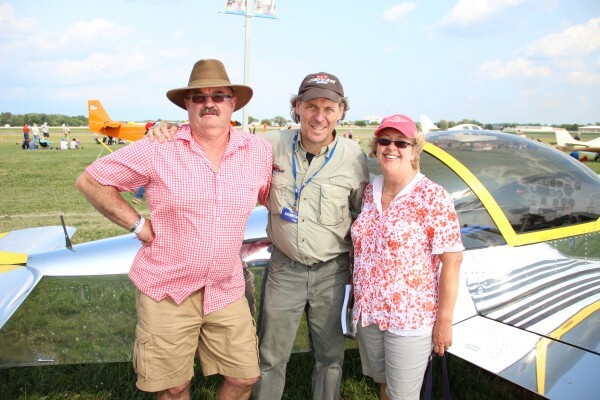 Above, Old breed EAA member Marv Hoppenworth, a class act guy who is well known among 50 year veteran EAA members. 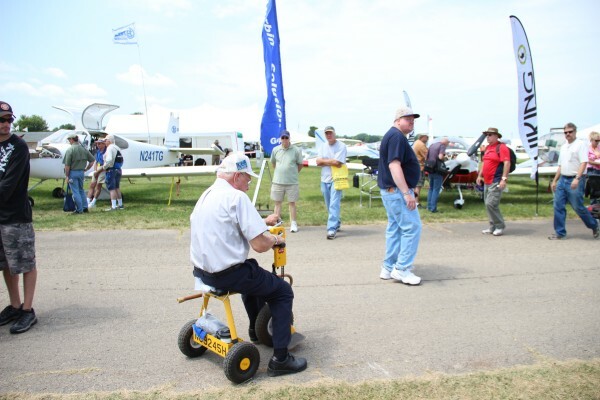 Years ago Marv designed all the pedal planes for kids seen at Oshkosh. He took his wife on their first date in an L-4. For Oshkosh this year, Marv made a special hand powered trike to get him around, He will not let advanced years keep him from getting around and staying in shape. 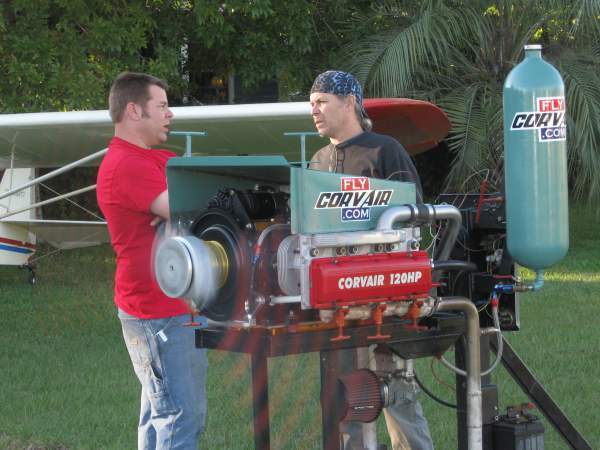 For at moving father-son story, read the last photo down on this 11 year old link http://www.flycorvair.com/osh2003.html ,it is about Marv and his son Jay. As much as I love planes, it is the people who love planes that make aviation captivating. Above, To balance all the rotten things I have said about the Internet over the years, here is something good: The couple above stopped by my booth to talk about Corvairs, but particularly mentioned things I had written here, singling out the story I wrote in June about a friend of mine who died at 23. The length of their trip is worth noting; they are from New Zealand. I am well aware that we present a lot of things here that are beyond the scope of ‘technical Corvair details and sales’, things that don’t belong on proper business sites. 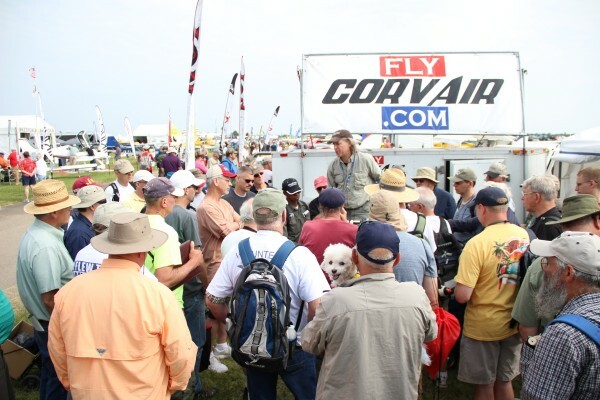 I try to keep Flycorvair.com more business like, and then have this site flexible enough to cover thoughts and ideas that compliment building and flying. As I said before, no one is required to read it all, far less agree with it. At best, I hope it is thought provoking, and I never intend for it to be thought providing. Not every story or perspective will appeal to everyone, and some of the most unusual stories have the smallest group to connect with, but if you are one of those people, the connection can be very strong, even if you live half way around the world in New Zealand. Above, the turtle deck of Ken Pavlou’s 2700 cc powered 601XL-B. 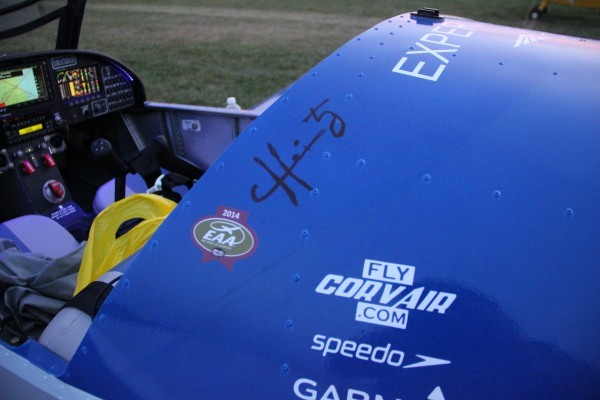 Some explanation is in order: The autograph is that of Chris Heintz, who paid a personal visit to Ken’s plane; the 2014 decal is for flying into Oshkosh; Our logo is a thank you note from Ken. The Speedo bathing suit logo is part of a joke around Ken’s friends. 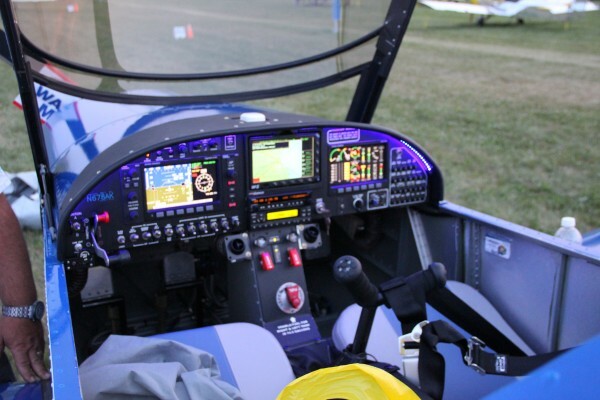 A year ago, Ken said that if he didn’t get his plane done and fly it to Oshkosh in 2014, he was going to come to Airventure wearing only a blue speedo suit (not a pretty picture of a 260 lb Greek guy). Ken is a man of his word, and this motivated him to work like a dog the last 12 months. Many of Ken’s friends stopped by the booth of the first day to find out if Ken made the dead line. Upon seeing his plane the most common expression was “Oh, thank God!” Having averted a visual image that would have been very difficult to later block out of the mind. Above, a look at Ken’s dual Dynon cockpit. Although I like simple old school panels, I will be the first to admit that this is a very nice, well executed glass cockpit. Corvairs are fully compatible with just about any type of instrumentation. If you compare the price of a top end Corvair build with an imported engine like a Rotax 912si or a UL-350, you can basically have the panel above with a very nice Corvair for the same price of the imported engine alone. That is a very, very large cost savings for anyone will to put in some effort to attain their goals in flight. 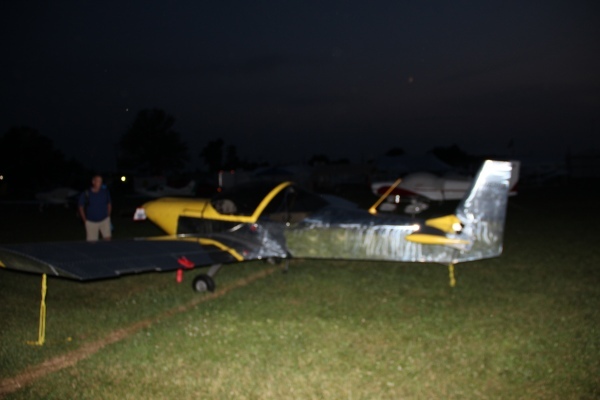 Pat and Mary Hoyt’s 601XL (it has a 650 canopy) on the flight line at night. Our booth was a focal point of fun and conversation until late into the night. This was the most fun I have had at Oshkosh in many years. 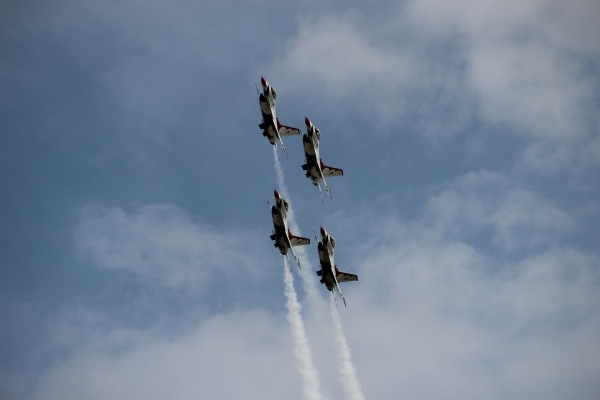 Above, Grace snapped this photo of four of the F-16’s of the Thunderbirds in action. I may have seen my lifetime quota of T-6’s in airshows, but for just about anything else flying in the show I will spend a few minutes looking up. What I like best about the Jets in afterburner: It drowns out the at yelling announcer voices. I would much prefer to listen to any aircraft, even the supersonic prop tips on a T-6, than to listen to the shouting announcers on a PA system. For a long time, the silent aerobatic glider routine of Manfred Radius set to classical music was my favorite act, and one day I realized that a big part of the appeal was the lack of narration in voices borrowed from used car commercials. When we were at Oshkosh this year, a man walked into the booth on a slow afternoon. 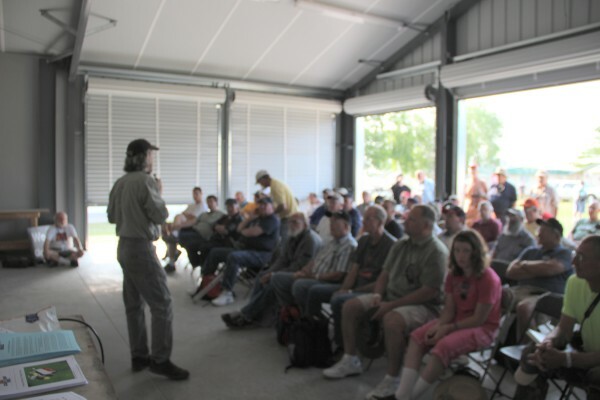 After 20 years of doing presentations at airshows, I can say that it is very hard to predict who the serious builders are when they walk in for a look, but I can always tell in 10 seconds who is there with an “issue.” None of these people are actual builders, they are all “Local experts” who want to tell me that they know more about Corvair flight engines than I do. Mostly, they are harmless blowhards there to complain that none of our builders respect their “advice.” But the particular guy who walked into my booth was a dangerous idiot because he had actually convinced a Corvair builder at his local airport to use cast pistons in his engine, completely against advice I have been giving for 25 years. He came to the booth to gloat over his success. In reality he had just seriously endangered the builder, and every one of the man’s future passengers, all for the sake of his own ego. Above, BHP’s Corvair powered plane The Last Original. This plane has 800 hours on it today. It lives at Brodhead and belongs to our friend Bill Knight. Contrary to what some people think, this plane has forged pistons in it. The builder in question is a guy I have known for years; He is a very nice guy, his Pietenpol is almost done and it is outstanding in appearance. At any grass strip, this man and his plane would inspire confidence to allow many people to let their child take a flight in his plane. Externally, this engine would even look like one “built to WW’s specs.” But with Chinese cast pistons in it, this plane contains a very dangerous hidden flaw with a very high probability of a disaster awaiting. Most planes that are the aviation equivalent of an IED look the part, and are presented by people who are easily recognizable as mentally ill. People understand to stay away. What makes the plane described to me at Oshkosh so dangerous is that the finish and demeanor of the builder will be very disarming. I don’t have to warn people about what to do if they meet a guy with a wild look, speaking about the afterlife and holding a grenade with no pin. This warning is about recognizing that sometimes the same grenade is wrapped in a very nice gift box, and the pleasant guy offering to let your kid look inside doesn’t himself understand the contents. All he knows is that his “local expert” (who will not be flying in the plane) assured him that he and his passengers were in no danger at all. Lets look at the lies one by one: 1) In reality, it is the “High Tech” cast pistons the idiot advocated putting in the engine that are made by the Chinese. Every forged piston we have ever sold was made in California, so the idiot had it 100% backwards. Every cast piston for the Corvair that I have seen for sale is a product of China. They may say “ISO-9001” on the box, but that is just printed words from a culture of corruption. 2) BHP’s own plane, The Last Original, does not have cast pistons in it. A number of years ago, Bill Knight, the owner, contacted us about upgrading the engine to my spec’s internally. The only visible external change is that the engine has our black prop hub, but internally, it is all modern stuff out of our Conversion Manual, including forged pistons. I have one of the original GM pistons in my shop, and it is in poor shape. Bill Knight made a very good call on standing the plane down until it was updated. The actual engine assembly on the update was done by Mark Petz, who was standing in the booth when the idiot was saying his lie. When I asked the idiot if he would like to personally meet the man who put the forged pistons in The Last Original, the idiot was dumbfounded. 3) Everyone who came to our booth at Oshkosh this year saw both the display engine I built and Roy’s water brake dyno. After Oshkosh, we went to Roy’s in Michigan for a day and did a complete break in run on the display engine before delivering it to a Canadian Zenith 650 builder. Because the engine was brand new, I didn’t lean on it very hard, but the engine pulled 76.5 HP at 2,675 rpm, which is below the static take off rpm of a Pietenpol. If the idiot was counting on a modern Corvair to only make 70 HP he is very wrong. I owned a dyno for years that we ran countless engines on in public, Roy has a better one, and Mark owns an even more sophisticated one. I am sure that the idiot based his guess on nothing, because that is what idiots do. Even if the engine was to produce only 70 HP, it should still have forged pistons. In reality, all the original GM pistons were cast, but they were vast better quality that the Chinese junk sold today. The GM pistons were all U.S. made and had a steel belt cast inside to control expansion and strengthen them. Because people flew them in the 1970s means nothing about Chinese parts today. The great danger in using cast pistons is that undoubtably the builder is going to use our CHT limits, ignition advance curves, carb jetting. cam, rpm, spark plug and prop recommendations, which are all based on the engine having forged pistons, a requirement I have held for 25 years. It is my prediction that the builder will blow a hole in one of his Chinese pistons in the first 25 hours of operation. When he does this, he may not get back to the airport, and he may wreck the plane and get hurt. Does anyone think that the idiot will then show up and build him a new plane and pay his medical bills? And then people will say, “See Corvair engines don’t work,” neatly ignoring that Continentals with the wrong pistons in them don’t work either. I have not included the name of the builder here, because I want people to focus on not listening to local idiots. I have said this countless times, and I have no idea why the builder couldn’t just say, “Sorry, no offense, but I am going to just follow WW’s recommendations.” After I publish this I am going to go on the Matronics Pietenpol list and state the builder’s name, and say that I do like the guy, but his engine is unairworthy. I will do this in hopes that he will change them, but if he doesn’t, and his Chinese cast pistons fail, it will be public record that I warned him, and maybe the next guy will learn not to listen to idiots. Above, Tom Brown’s Pietenpol, flying since 1982. It has more than 1,500 hours on it. It is often said that this plane has cast pistons in it, but we are very good friends with Tom, and he has told me that he and his dad rebuilt the engine after briefly flying it in 1982. It may have forged pistons, but if it does have cast ones, they are U.S. made ones from GM, and they are vastly better quality than any cast piston from China. This plane does not use the full ignition advance, cam nor carb jetting we use today. It is not possible for me to express how much I detest people who will not fly in planes, but give advice to others contrary to what our testing has shown. Words like “Vermin” hardly cover it. I suggest that people read my story about how fools in aviation have an ironic way of hurting others and walking away without a scratch, at this link: Effective Risk Management – 2,903 words. The link contains the story of a great aviator, Phil Schact, a man hugely influential on Grace’s flying, who burned to death as the direct result of an idiot’s actions. In the year that followed that accident, I spent a number of long quiet nights sitting on the front porch thinking, and came to the conclusion that I will never be a good Christian, because I was not willing to even contemplate forgiving that idiot. I understand the power of forgiveness, in my life I have been both the recipient and the grantor, but we know the real measure is can you forgive the unforgivable? By this measure, I will always fail to forgive dangerous idiots in aviation. No matter how long I live, I will go to my grave with this black mark on my heart. -ww. If you are planning on attending the College #30 in Mexico MO in September, we are now just 36 hours from the sign up deadline. I am closing the sign up sheet Friday night at midnight, from that point the college is just one month away. Blast from the past 2005: Sebastien Heintz, Grace and myself at the Zenith factory in Mexico MO in 2005. It was a stop on our Midwest night school tour that year. Over the last 11 years we have had two ‘Corvair days’ and two Corvair Colleges at Zenith’s facilities. We have purchased both 601 and 701 kits from the Heintz family and enjoyed a long standing cooperative working relationship that directly benefited countless builders.